I went back and forth on whether I was going to review this movie for Flayrah. I meant to when I watched it, as I knew it would contain quite a few talking animals, including the titular dragon, but then I got behind, and I wrote my top ten list, where it fell at number eight, so I figured that was good enough. Then it was nominated for the Ursa Majors (which I called early, by the way), and wound up as the second-most-furry nominee of the year (after the still-not-very-furry My Little Pony: Equestria Girls), so I decided to review it for Flayrah after all. Better late than never. That doesn’t mean I’ll be reviewing the other nominees, even though I did enjoy three quarters of them (and, surprisingly, it’s not the Pixar movie I’m hating on here); I just didn’t find them sufficiently furry, or even furry at all, and am a bit perplexed at their nomination over furrier fare like Ernest and Celestine, Epic, Turbo, Free Birds, or even The ABCs of Death. Why does this movie even exist? Fun fact: J.R.R. 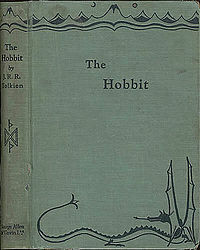 Tolkien intended The Lord of the Rings to be one volume; the publisher split the overly long novel into three, against Tolkien’s wishes. He'd probably hate what these movies have done to his novel. That said, Tolkien is dead, so his opinions don’t count for much. Luckily, the vast majority of living people tend to think… actually, they tend to agree with the dead guy. This did not need to be a trilogy. It was apparently, around the time Guillermo del Toro was director, just going to be two movies. That I can at least agree with; it’s a long book. The general theory is that, by making three movies, the studio makes more money; most of this was going to be filmed anyway, then cut to be added back to the super-extended director’s cut (yes, apparently three three-hour-long movies weren’t enough to cover all the nuances in one children’s novel), so they were already paying for most of it. What’s a couple more millions spent for what would most likely make billions at the box office? Of course, Peter Jackson took an hour to get to the freaking island in his King Kong remake. Maybe he just has problems with cinematic bloat. We work with what we got… and though we didn’t exactly need it, once we got it, it’s pretty good. As an adaptation, it’s questionable, even beyond the bloat; despite adding subplots that were only vaguely hinted at in the book – or in one notable instance, are completely original – they still manage to cut things. The moody scenes in Mirkwood are truncated, including scenes in which the dwarves and hobbit chase after a vanishing elven dinner party. Also gone is one furry element. A thrush makes a cameo in the movie, but it’s clear that his role in the climax of the book, in which he informed a hero who could speak thrush of some very important information, is not happening. I’m in the awkward position of trying not to spoil a movie that doesn’t even have a poster yet, but this character kind of appears out of nowhere and does something very important that should have by rights been done by the band of characters we’ve been following since the beginning of the book. It’s one of the weaker elements of the novel; one of the movie’s additions is that our protagonists get to meet and interact with this character, allowing the audience to get to know him, and making him less of a deus ex machina in the third movie. Another addition alleviates another problem; outside of Thorin Oakenshield (Richard Armitage), most of the dwarves in the party don’t have much in the way of distinct personalities. In the movie, the dwarf Kili (Aiden Turner) develops a relationship with the elf Tauriel (Evangeline Lilly), something that not only doesn’t appear in the novel, but would probably never have occurred to Tolkien. It’s a bit jarring at first for Tolkien fans, because it’s so obviously “not the text” – but once you get over that, it’s surprisingly touching, and one of the highlights of the movie. Other highlights include an absolutely rollicking extended fight scene based around the barrel riding bit from the novel; yes, it wasn’t a fight scene in the novel, but this is filmed so kinectically, with such a great sense of movement, who cares? 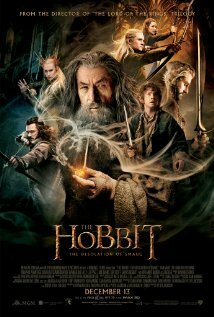 It’s slapstick, sure, but this is pretty much the best live action slapstick outside of a Gore Verbinski movie; and, though many Tolkien fans will deny it to their last breath, The Hobbit was meant for kids, and the fans who deny that are the boring fans. One disappointment is the relative lack of Martin Freeman as Bilbo Baggins, the titular hobbit. Okay, so he is in there quite a bit, but for being the titular character, we need more Bilbo! He was pretty much the only thing worth remembering from the first movie. Freeman has nailed the part by almost not nailing it. For an example of what I mean, his “sure, whatever” reaction to Gollum (Andy Serkis) in the last movie telling him he’ll eat him if he loses the riddle game was actually the exact opposite of what I would have expected, and therefore perfect. There are some talking spiders and a werebear near the beginning, but they’re basically bit players; what we bought our tickets here for was the other titular character, and boy does he deliver. Poor Benedict Cumberbatch is getting typecast as a villain (his most likeable role last year was as a slave owner in 12 Years a Slave), but he sure does a good job of it. He’s just the voice here, but he holds up his end of the bargain. The special effects hold up, too. The character is big, menacing, and the design is classic enough that we can get behind it, but new enough that it isn’t boring. 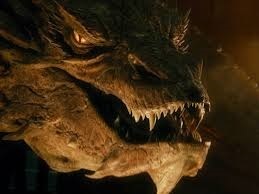 There’s more worth watching in this movie than Smaug, but if you’re just here for the dragon, well, you’ll still go home happy. One final note: this movie ends abruptly. I was actually surprised that I liked the first movie as much as I did. I had to read the book in high school, and hated every minute of it. It was without a doubt the most boring fantasy novel I had ever read. My friends were of a different opinion, though, and I was dragged to see the first movie. Instantly I noticed that the movie seemed to pick up the pace far quicker than in the novel. I wound up enjoying it, I must admit. Then I heard that Bard was set to appear in the second movie, and I got my hopes up. His involvement in the novel was ridiculously light, but to have him be more present in the movies was wonderful. Haven't seen the movie yet, I must admit, but I look forward to it. A Boy Becomes A Man… And A Dragon?